John Umlauf, Trumbull, Conn., was promoted from culinary director to senior vice president of culinary operations at Saffron Road Foods. He still misses the Northwest and comes home as often as possible to visit family in Seattle. Leslie Kennedy, Liestal, Switzerland, earned her Master of Arts in Visueller Kommunikation und Bildforschung from Hochschule für Gestaltung und Kunst Institut Visuelle Kommunikation in Basel, Switzerland. David Stevenson '78 recieves the Banff Mountain Fiction and Poetry Award. David Stevenson, Anchorage, Alaska, won the 2014 Banff Mountain Book Competition’s Mountain Fiction and Poetry award for his collection of short fiction, Letters from Chamonix. This year, University of Washington Press will publish his book of literary essays, Warnings Against Myself. He directs the low-residency MFA program in creative writing at the Univ. of Alaska. Mark Singleton, Sylva, N.C., executive director of American Whitewater, was the featured speaker at Western Carolina University’s new outdoor adventure series. An advocate for the restoration and protection of rivers, he has experience as a whitewater paddler and raft guide, and he’s been involved in the marketing of outdoor activities and nature-based tourism for more than 20 years. Bruce Pavitt, Seattle, released his latest book, Sub Pop USA: The Subterranean Pop Music Anthology, 1980–1988, which centers on the independent music scene of the 1980s. Victor Shamas, Tucson, Ariz., an adjunct lecturer in the University of Arizona’s Department of Psychology, had a new book he co-authored, Repose: The Potent Pause, spend three days last fall atop the Amazon Best Sellers list in two categories (one of which was Science and Math Short Reads). Brad Shannon, Olympia, longtime political editor and statehouse reporter for The Olympian, is the new editorial page editor. Bets Greer, Tucson, Ariz., recently completed a three-year meditation retreat in southeast Arizona, after finishing six years of study in the Tibetan Buddhist tradition. Greer earned an MPA in 1992 from Harvard University’s John F. Kennedy School of Government. Aaren Purcell MES, Tacoma, moved to a cabin on Commencement Bay that had plumbing installed 30 years ago by MES students as part of a project to control non-point source pollution. He works as an archivist and records manager for Seattle Public Schools. Annie Appel, San Pedro, Calif., a documentary/fine arts photographer, completed The Occupy Portraits: A Photo Essay, a collection of more than 500 images she took of Occupy movement activists in 12 cities across the U.S. (including Olympia). A suite of these photographs has been accepted for inclusion in the permanent collection of the Smithsonian’s National Museum of American History. This book can be viewed at Documenting Worlds. Jen Whitewing, Boise, ID, is publishing and doing volunteer work for ALPHA (Allies Linked for the Prevention of HIV/AIDS), a nonprofit that provides HIV and AIDS education, testing, and support in Idaho. Paul Ortiz, Gainesville, Fla., assumed the presidency of the Oral History Association for 2014-15. He previously served as the association’s first vice president and president elect and chair of its nominating committee. Ortiz is an associate professor of history at the University of Florida and the program director of the university’s Samuel Proctor Oral History Association. Louise Kornreich, Seattle, graduated from North Seattle College’s Nursing Program. Now that she’s a licensed RN, she said, “I hope to finally start my career.” She is interested in the fields of hospice, wound care, and psychiatric and pediatric nursing. Jeff Rucker, Los Alamitos, Calif., works for Kaiser Permanente and is currently involved in regional-level training and development in Southern California. Robert Steelquist, Sequim, retired from NOAA in May 2014. He has a book contract with Timber Press and he’s a volunteer wilderness ranger at the Okanogan-Wenatchee National Forest’s Pasayten Wilderness and a chef at the Alder Wood Bistro in Sequim. Robert Biswas-Diener, Milwaukie, Ore., co-authored The Upside of Your Dark Side, a book “centered on the counterintuitive thesis that anger, guilt, and other psychological unpleasantness is actually beneficial.” It has been spotlighted by Forbes; O, The Oprah Magazine, Success, New York, the Chicago Tribune, CNN, NPR, and other media outlets. Frank Hinojosa MES, Chehalis, has 20 years of experience in natural resources, environmental science, and watershed ecology. He’s also an educator, singer-songwriter, business manager, and promoter, and the sole proprietor of Aztlan Bard Management. His current project is promoting author Andera Ryan ’05 and her memoir, Child of Innocence. Learn more about the project at Child of Innocence. Cat Kenney, Cleveland, Ohio, has completed her second master’s degree, this time in speech and hearing pathology from Cleveland State University. She previously earned an MFA in theater from Kent State University in 2001. Her particular area of interest is neurocognition. She continues to teach theater and write plays, and occasionally still draws comics, mostly on the napkins of Cleveland-area coffee shops and restaurants. Maya Parson, South Bend, Ind., is a writer; the editor of Edible Michiana, a magazine about the South Bend’s local food movement; and the author of Cultured Grub, her blog about food and culture. She has a PhD in cultural anthropology from the University of North Carolina at Chapel Hill. She and her husband, Grant Ramsey ‘97, a professor of philosophy at the University of Notre Dame, have two children. Selfie by Carlos Sánchez '97. Carlos Javier Sánchez, San Antonio, Texas, joined the San Antonio Business Journal as a visual journalist. He earned his master of communication degree in digital media from the University of Washington. His work has been published in The New York Times, Houston Chronicle, Washington Post, Bloomberg News, and Time. Amy Moreno-Sills, Puyallup, and her husband Agustin have started their own certified organic vegetable farm, Four Elements Farm, after managing other area farms for more than a decade. She said they are excited to be living the dream and sharing it with their children. Louie Crowder, New Orleans, La., recently published a play and a book. The play, A Better House for Ritchie, centers on a gay couple in the Deep South planning to move to Canada following an act of violence. In his novel, In Irons, a New Orleans bartender goes to sea, being chased in his dreams by a great white shark. Scott Frakes, Olympia, was named director of the Nebraska Department of Corrections following a national search. He worked for the Washington State Department of Corrections for more than 30 years, including as deputy director overseeing six prisons, 2,800 staff, 8,000 inmates, and a biennial budget of $450 million. Marcus Hambrick MES (BS ’94), was named deputy director of the Office of Economic Security at the Colorado Dept. of Human Services. Newkirk Johnson MES, Warren, Penn., was voted onto the board of directors of the North Country Trail Association, the nonprofit partner of the National Park Service stewarding the 4,600-mile North Country National Scenic Trail. He is executive director of Friends of Allegheny Wilderness, which he founded in 2001. He sits on the board of the Conewango Creek Watershed Association and is a member of the City of Warren Parks and Recreation Commission. Rev. Donald Davis, Jr. is the new senior pastor of Bethel African Methodist Episcopal Church in Yakima. He is a registered counselor and chemical dependency specialist and has worked in the ministry for more than 32 years. Russell Rogers MES, West Chester, Penn., is working as an agriculture specialist with U.S. Customs and Border Protection. Marlies Wierenga MES, Portland, Ore., is the Pacific Northwest conservation manager for WildEarth Guardians. Brandon Lanich, Durham, N.C., a certified clinical herbalist, graduated from the Blue Ridge School of Herbal Medicine in 2013 and started Hermitaj Botanicals, an online and local herbal medicine apothecary that supports mental well-being. Dawna rosenberg MiT, earned National Board Certification in teaching in 2014. She teaches at Park Lodge Elementary in Lakewood. Wade Jerdee MiT, earned his National Board Certification in teaching in 2014. He teaches language arts and social studies at Lochburn Middle School in Lakewood. Theresa Nation MES, Olympia, is a fish and wildlife biologist for the Washington Department of Fish and Wildlife. Amy Savage, Raleigh, N.C., is investigating insect diversity across urban habitats as part of her postdoctoral research at North Carolina State University. She earned her PhD in ecology and evolutionary biology from Rice University. Victoria Benson MiT, a first-grade teacher at Lacey Elementary School, received a Cause for Applause award from North Thurston Public Schools. Jerry Price MiT, Yelm, earned his National Board Certification in teaching in 2014. He teaches history at Ridgeline Middle School. Visudha de los Santos, Taos, N.M., a sound healing alchemist, recorded and released her first CD, Sedna’s Prayer: Receiving Grace Through Sacred Vibration. Frank Casey MiT, Gig Harbor, an art teacher at Clover Park High School in Lakewood, earned National Board Certification in 2014. Aimee Beth Leggett MiT, Olympia, a visual art teacher at Timberline High School, earned her National Board Certification in 2014. Kai Liikane MiT, Bainbridge Island, earned her National Board Certification in teaching in 2014. She teaches at Silver Ridge Elementary School in Silverdale. Kate Meghji, Lawrence, Kan., is executive director of the Lawrence Humane Society, which serves nearly 4,000 homeless and abused animals each year. She plans to expand services to low-income residents of the county and pursue the implementation of cutting-edge shelter medicine and animal-sheltering practices. Eve Rickert MES, Vancouver, B.C., is the mastermind behind Talk Science to Me Communications, an organization that transforms scientific information into stories through writing, editing, illustration, design, and web development. Marc Goss '07 with a baby elephant in Kenya. Marc Goss, Kenya, has served as manager of Ol Choro Conservancy Maasai Mara and the Mara North Conservancy. In 2011, he helped found the Mara Elephant Project (MEP), which has arrested more than 260 poachers, middlemen, and dealers, and has developed a large intelligence network, deploying 30 rangers in poaching hotspots. MEP plans to deploy more human-elephant conflict mitigation teams to areas experiencing the worst problems. Joshua Parker MiT, Olympia, earned his National Board Certification in teaching in 2014. He teaches at Shelton High School. Ben Hammer Marcus and Taryn Hammer Marcus ‘09, Whitefield, Maine, opened Sheepscot General, a country-style store situated on a working farm, in 2011. Besides serving as a local meet-up spot, the store offers a lending library, yoga and art classes, a café, certified organic produce, and a full line of groceries. Chris Soriano, Capitola, Calif., was honored by his employer, the California-based Web of Life Field (WOLF) School, as Naturalist of the Year. The WOLF School is an environmental education organization. Rich Tomsinski MPA, Olympia, accepted a one-year fellowship position with Results Washington, part of the Office of the Governor. He will manage projects designed to create a more efficient, effective, and accountable state government. Lorri DeFoor MiT, a math teacher at North Thurston High School, earned National Board Certification in 2014. Robert Gandy MiT, Seattle, earned his National Board Certification in 2014. He is a sixth-grade reading, writing, and social studies teacher at Asa Mercer International Middle School. Joanna Barnes MiT, Olympia, earned her National Board Certification in teaching. She teaches at Pleasant Glade Elementary in Lacey. Kary Brennan, Twisp, opened Gathered, a boutique in Winthrop. The store features women’s clothing, accessories, leather goods, and home decor items that come from sustainable and ethical manufacturers. Alaina Hellum-Alexander MiT, Seattle, earned her National Board Certification in teaching in 2014. She teaches mathematics at Asa Mercer International Middle School. Stephanie (Hoatson) Kneeland MES, Olney, Md., is employed as a Home Performance with ENERGY STAR deputy program manager at ICF International. Shon Eck, Ashland, Ore., launched an asset management company. He is a partner at American Templar and earned his JD at Arizona Summit Law School in 2013. Teale Niles, Portland, Ore., is the community clinics operations coordinator for the National College of Natural Medicine. Christopher Russell, Mukilteo, participated in Miami University’s Earth Expeditions global field course in Baja California. Russell, an animal caretaker at the Pacific Science Center in Seattle, took the graduate course in pursuit of his master’s degree from Miami University’s Global Field Program. Joseph Boyer MiT, Yelm, was honored as Educator of the Month in March by Lakewood Rotary. He is a humanities teacher at Clover Park High School. Jerilyn Walley MES, Olympia, is a restoration project manager for the South Puget Sound Salmon Enhancement Group. Heather Glock, Yelm, is an account manager for Esri, a geospatial/mapping software company. Katie Wolt MES, Olympia, is a health educator at Washington State Department of Health. If you’re an alumnus we’d like to hear your stories. 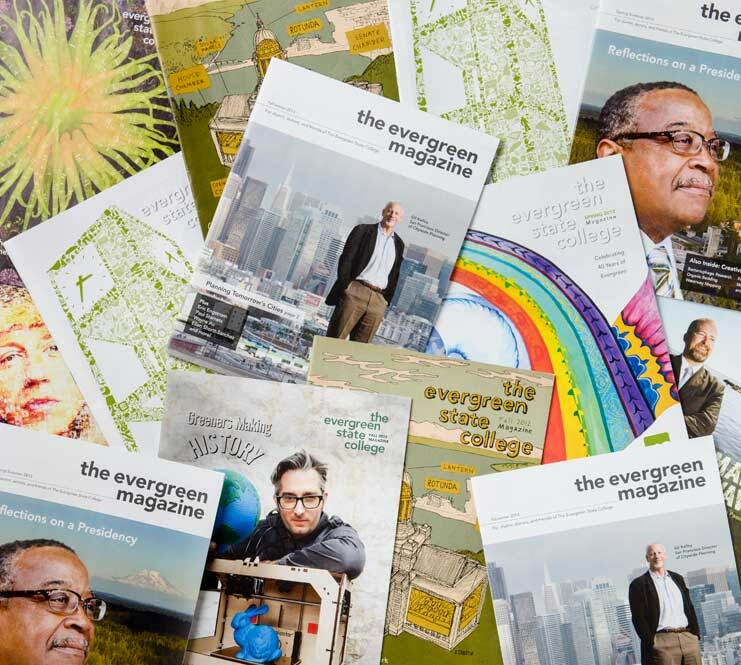 Send us your news by submitting your class note or emailing alumni@evergreen.edu. Be sure to include a phone number where we can reach you.